Hello December! Where did you come racing from? I'm sticking to my 'flowery first of the month welcomes' with another flowery post. Nothing too quirky or clever this time, but something a bit special. As most of you know I'm a florist so I guess it goes without saying that over the years I've often imagined how my wedding bouquet would look. Sometimes I'd prefer a simple posy of scented sweetpeas or gadenias, or something funky using fruit and sticks, or perhaps an armful of trailing vines entwined with colourful orchids, or a big blowsy bouquet of peonies. In fact I used to joke that I'd have to get married 100 times to have all the bouquets I wanted. But until recently even though I've made a lot of wedding bouquets, I've never had one I could call my own. Last weekend Mr Daisy and I walked down the grassy aisle, and in a cathedral of trees we tied the knot. We've considered ourselves married in our hearts for a long time but this was the real deal ceremony that makes it official, so I got to have my very own wedding bouquet! In the end, after all my flower fantasy bouquets, my choice of flowers was deternined by my dress. I tried on a few dresses of different soft pretty colours, but in the end it was an orange sequin dress that ambushed me and insisted it was the one. A simple style, but nice and sparkly. With my orange sequined dress as my muse, and knowing Mr Daisy was wearing a pale blue, grey suit, I planned my bouquet. An informal posy of seasonal flowers, with the majority of things picked from gardens the day before. Here's a list of all the bits and pieces that I used. It's a wonder I could fit so much into a little bouquet. It certainly made it fun to look at, with different angles revealing different things. I had some cream lace read to cover the stems but at the last moment I decided to tie it with a simple strips of 1inch cuts of fabric. Lovely unfinished fraying edges and a loose floppy bow seemed just right for the quilter in me. I've saved and washed the ribbons with plans of using them in a quilt one day. 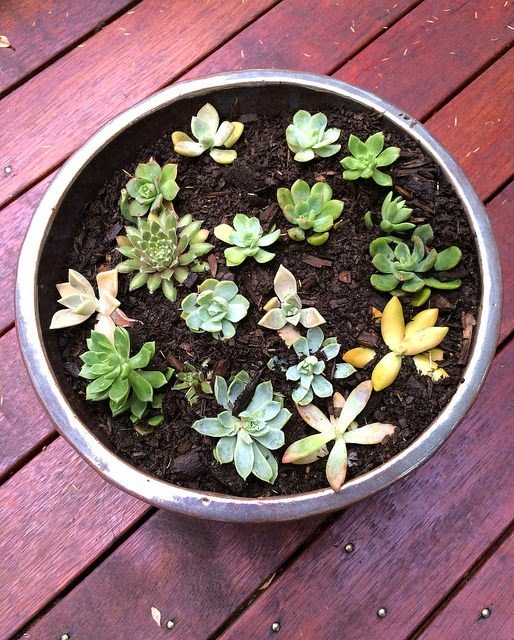 And planted the succulents. Hopefully they'll take off and grow and be a happy reminder of a wonderful day. I only got a few snap shots before it was time to run out the door. And none of my flowery headpiece, or the grooms buttonhole. We had professional photos taken on the day so there'll be proper pictures to share one day soon. In the meantime I've got a lot of blog reading to catch up!! I'm looking forward to seeing what everyone has been up to. That is stupendous! Many many happy felicitations! May your smile muscles never tire and your happy days be many. What's not to love about love! So happy for you both. .
Congratulations to you both and what a beautiful bouquet. Who would have thought you could make all those different flowers work together so well! Cant wait to see some more photos! Congratulations! You did yourself proud with your fantastic bouquet! Hi Rachel, I am so happy for you both even though I haven't met Mr Daisy I am sure he is one hell of a bloke. Congratulations! Your bouquet certainly looks beautiful and unique to you, a lovely choice. Can't wait to see some photos, love wedding photos! Wishing you both a long, happy future together. A joyous event for both of you. May you always wake up to beautiful mornings with your Best Friend. Congratulations to you both. OMG!!! That accounts for radio silence!!! Bestest most fabulousness news happily ever after. Most wondrous of posies, reads like a Victorian language of flowers and lives on in a to-become quilt and in the garden...oh, oh, oh, am filled with happiness for you. Need to go an look at the posy again. Big love to you both, big hugs and big wishes for your future life together. Congratulations Rachael and Mr. Daisy! It sounds like a beautiful wedding ~ many good wishes for a long and happy life together! florists--my first reaction is ---OF COURSE! You are creating all the time--and that is so you! Congratulations to you and Mr. Daisy! My most sincere congratulations to you and your husband, Rachael ! Your bouquet is beautiful and I'm looking forward to seeing the pictures of your special day ! Oh my goodness - that is WONDERFUL!!!! Much love and congratulations to you both. I love your bouquet. And I love that so many of your flowers came from gardens and a holiday. Not to mention that beautiful fabric bow. I love, love, love this post and look forward to more photos! You sneaky pair ! Im am absolutely thrilled for you both. Thats such wonderful news. All my love and massive hugs to you both. What a wonderful bouquet ! A big congrats to you. Your bouquet is beautiful and I can't wait to see the wedding photos! Here's to many, many years of happiness to you & MRI Daisy! Oh my! Congratulations to you both. what a wonderful wonderful surprise to hear. I love your bouquet. It is a stunner with such great color, textures and balance. Oh I'm giddy with delayed excitement! A bride! I can't wait to see photos. Many Happy Returns on your super special Day! RD! I hope you had FUN being a bride! I think it looks like you did. I hope you will let us see the orange sequined dress -- it sound fabulous! 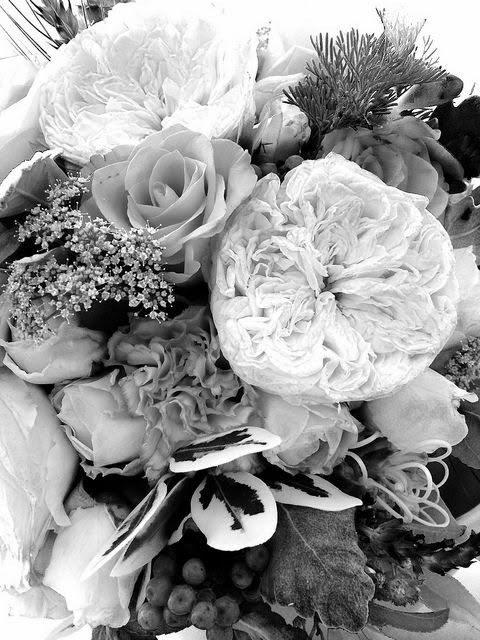 Your bouquet is gorgeously beautiful. Congratulations to Mr. Daisy, I think he did really well. And felicitations to you, Mrs. Daisy! What a lovely boquet and such happy news. Thanks so much for sharing the details. Wishing you many years of joy! Congratulations on your marriage. Your bouquet is gorgeous. Love the variety and colors! Oh! So happy for you!!! Congratulations!! Even though your hearts have been tied for a long time, it's still very exciting to make it official. Your bouquet couldn't be more beautiful. I love your fabric tie. Hoping you'll post those photos as soon as you get them. I can't wait to see you in that orange sequined dress! Big hugs to you both. Best wishes to you and your hubby! 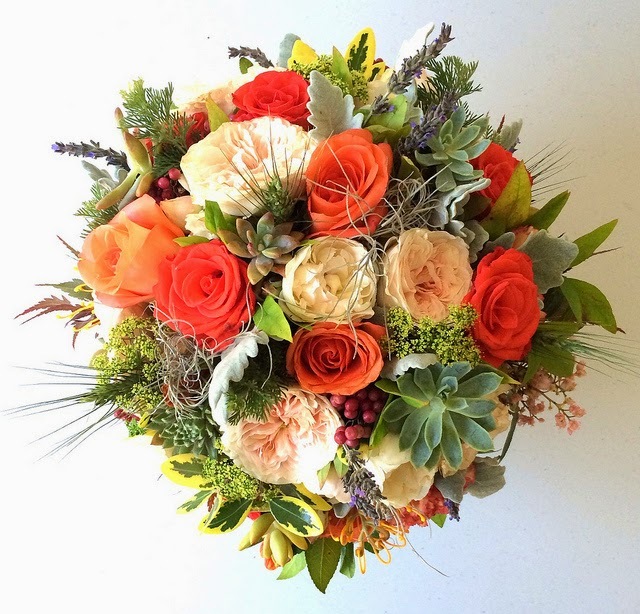 Your bouquet is beautiful - amazing that you got so many different flowers/plants into it! Congratulations to both of you! Your bouquet is gorgeous. Being a huge fan of succulents, it thrilled me to see them used in this fashion. And to have them as a growing reminder is brilliant! Oh Rachael I had tears in my eyes reading your lovely post! I am so happy for you and the flowers are so you! I love that you added succulents, a very unusual but perfect touch. Congratulations Rachel! I wish you and Mr. Rachel many happy years together. Your bouquet is gorgeous. 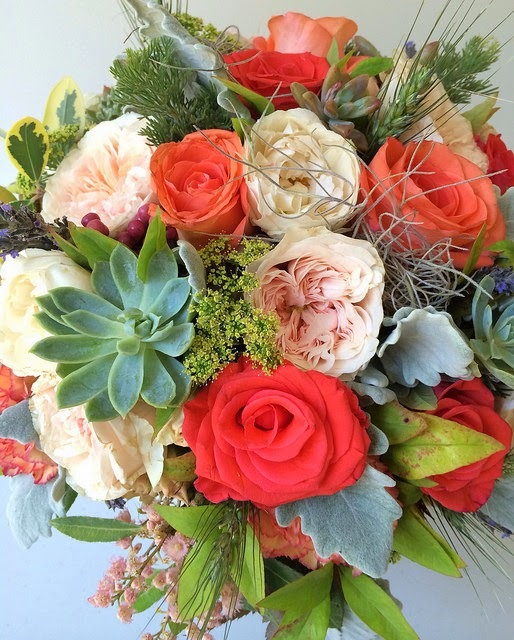 I adore the combination of the orange roses with the frosty blue tinged succulents! It is absolutely stunning! Congratulations - wishing you both many more happy years together. What a beautiful bouquet you created. Congratulations! Wishing you both a lifetime of happiness and joy. What a wonderful surprise for all of us. 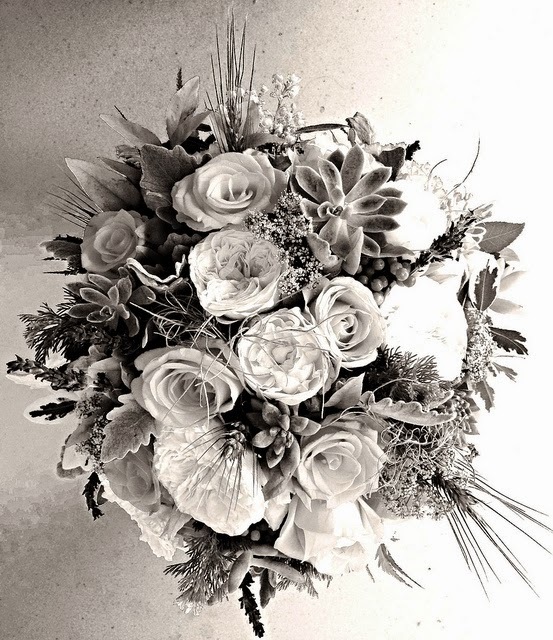 Your bouquet was a stunning arrangement that seems to have reflected you and your artistic side. I'm so happy for you and of course, Mr. Daisy too. Oh Rachael and Mr Rachael - congratulations! What a beautiful bouquet you have created; it is full of memories for you both. You have a wonderful eye for design. Congratulations, that is the most awesome news. 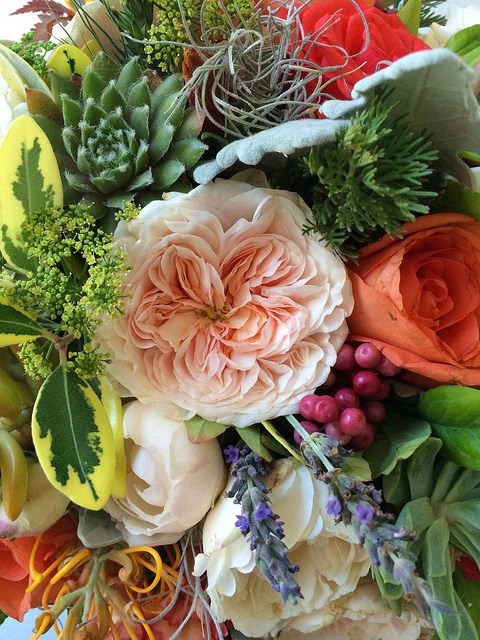 I love your bouquet, so perfect for you and that you have pieces from your garden and your friend's. It's wonderful that you have planted the succulents as a reminder of your day. I can't wait to see the photos of you and the mister. I'm so happy for the both of you. How sweet, Rachael! Your bouquet was beautiful and the keepsakes from your wedding will be such treasured reminders of the special day. Congratulations!!!! I love your flowers and I wish you and your man all the best my friend. Congratulations! You kept that little beauty a dark secret! I hope you will both have a very happy future together. Your bouquet looked stunning, very different from the usual bride's bouquet. Hope you post some wedding photos soon. Ohhhhhh! Rachael! I was thinking the same as Susan and hoping the title was for you! Best wishes! Lovely bouquet! I am sooooo happy for you! On my goodness, I have goosebumps, huge congratulations to you both. I love what you've done with the bouquet pieces. Doing a happy dance for you! Oh sweetie huge congratulations to you and Mr. Daisy....that has to be the most beautiful and special bouquet I've ever seen!!!!!! Every happiness to you both!!!! CONGRATULATIONS to you!!! I am so happy for you and Mr. Daisy. I can't wait to see the photos of you and the special day. That is just wonderful!! omg I knew something was up. I was just about to email you as to where you had gone...and now a wonderful wonderful happy post...so lovely..so grand...and only you with sprouts from chicken feed...!! What wonderful news!! Congratulations to you both - I wondered where you had got too, but now I know!! More pics of the wedding are needed! Good to have you back, and so cheerful and happy! Congratulations Rachael! Best wishes and happiness to you both! How Wonderful! Your flowers are beautiful -- Congratulations!!! Yousa, I am late to the party!! Hello December is right :) I cannot wait to see that dress, I love orange and with that bouquet........mama, what a treat. Yay for you guys. Nice job sneaking it under the radar. There be a few old friends of you and Mr Daisy with jaws hanging open. Oh Rachael how beautiful...I am smiling from ear to ear at this post. Your bouquet is a one-off and just so special! Oops I didn't mean to push publish! Wish g you and Mr Daisy many, many years of Happiness...I just love his post! This is so exciting. Congratulations to you both and best wishes for a future together full of happiness. Your bouquet is simply gorgeous and so special! Congratulations Rachael - your flowers are simply stunning - best wishes for a wonderful future together. I am smiling ear to ear with happiness for you and Mr. Daisy! Oh my what a surprise! I think this post has to be my favorite of all time! 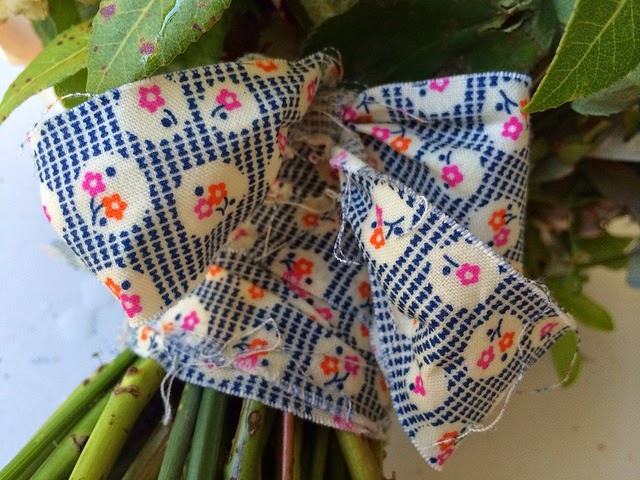 Love the bouquet you made with the strings of fabric. I wish you life time of happiness together! P.S. I absolutely adore your bouquet. It's beautiful with the ample blend of flowers, succulents - and berries! 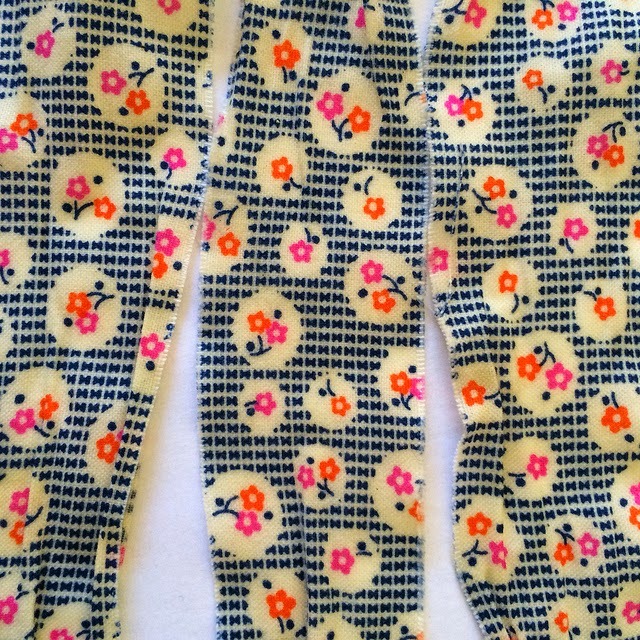 love those in there, and the fabric ribbon touch is perfect. Best wishes and congratulations to you both. Your bouquet is lovely, when do we see pictures of the bride and groom? Your bouquet is so perfectly you! 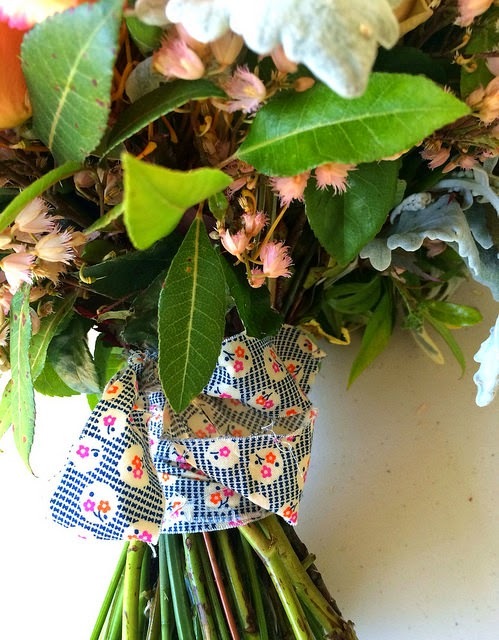 I love how you gathered flowers and tied it with fabric. Perfect, perfect, perfect. So happy for you and Mr Daisy. Maybe he should change his name!!??? oh WOW YOU!!!! well that one was a surprise!! congratulations and what a lovely bridal bouquet! One of the happiest posts I have read in a long time. Beautiful flowers! Congratulations. Looking forward to more pictures. So VERY happy to read this happy post. I'm so happy for you! Congrats! 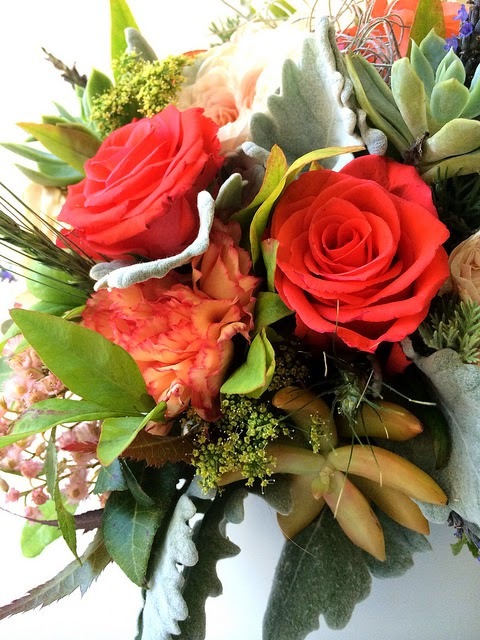 The bouquet is so lovely and cheerful---kind of like you! Best wishes for every happiness! Stunning bouquet, I love everything about it - and that's a lot! How perfect, sparkly orange dress on your sparkly perfect day, like the bright warm sun...congratulations! Congratulations. What wonderful news. I just love your bouquet. Who'd ever think of that combination, but it works so very well. It is a lovely touch to plant the succulents and hopefully use the fabric bow in a quilt. I do hope you share some wedding photos one day. 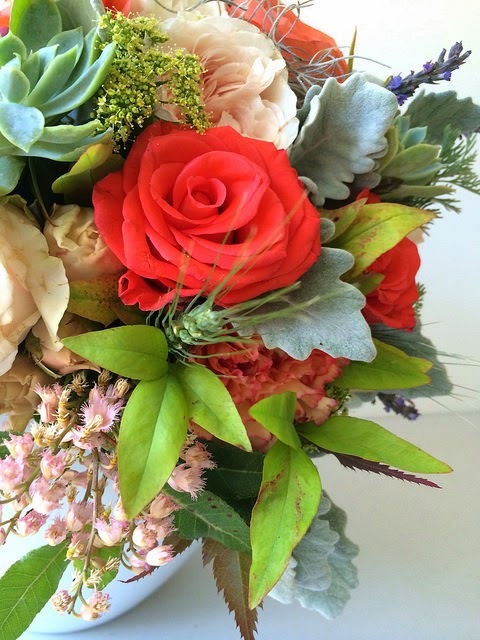 How did I miss the wedding bouquet blog!! Fabulous photos. Congrats on making it official. Wishing you both all the wonderful things you wish yourselves. Oh wow! I missed this one - until now! Congratulations, such wonderful news and I LOVE your eclectic bouquet, very special indeed. I also love that you have planted the succulents and have plans for the ribbons - perfect!